Tips for Reverse Shoulder Replacement. The reverse shoulder replacement can restore motion and decrease pain to a shoulder that was relatively useless due to pain and lack of motion. The rehabilitation following the reverse shoulder replacement surgery is similar to the conventional replacement surgery. Following the reverse shoulder replacement surgery, the patient’s motion will be limited to approximately shoulder level. 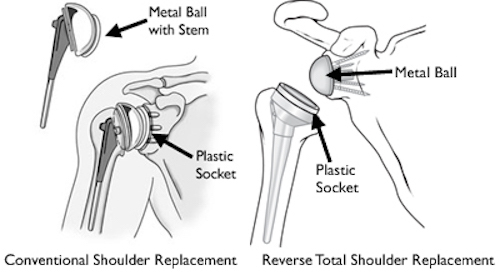 Reverse shoulder replacement surgery can be considered a salvage procedure. Your Physical Therapist will guide your rehabilitation based on the surgeon’s protocols. Any joint in the body that moves can develop arthritic changes. Arthritis is a condition that involves the break down or wearing away of the smooth cartilage that covers the ends of the bones. Joints that bear weight and those that move excessively are more prone to these changes. While the shoulder joint may not bear weight like the knees and hips, it is often used to handle weight and move at the same time. In fact, it moves more than other joint. Movement over a life time can result in an arthritic condition. The unstable nature of the shoulder joint and the constant stress of regular movement can contribute to damage. The shoulder joint is comprised of three bones, scapulae, clavicle and humerus. The head of the humerus rests on the glenoid fossa of the scapula where it articulates when the muscles of the shoulder contract to move the arm. The head is held “against” the glenoid surface via the four Rotator Cuff (RTC) muscles, which act in unison and form a force couple when the arm is moved. These muscles are responsible for moving the humeral head in a downward direction when the arm and hand are moved upward to shoulder level or higher. The shape of the shoulder joint, similar to a golf ball on a golf tee, is ideal for mobility and motion, but not stability. Over time, the lack of stability can lead to many problems, and the joint surfaces can be compromised and ruined. If there is also irreparable damage to the rotator cuff tendons the involved shoulder is almost totally useless due to pain and lack of motion or a pseudoparalysis. Traditional shoulder replacement is a viable option to repair damaged cartilage surfaces as long as the rotator cuff tendons are intact or can be “fixed.” This surgery incorporates the use of plastic and metal implants that resemble the normal shoulder anatomy. There is a metal “ball” placed on the end of the humerus and a plastic “cup” that acts as the glenoid fossa of the scapula. Traditional options are not possible with serious rotator cuff tears. The rotator cuff muscles control the humeral head and keep it flush on the glenoid fossa and move it downward when the large, more superficial muscles contract and move the arm in an upward direction. If the rotator cuff is damaged, the large muscles move the humeral head, but it does not stay in the glenoid fossa. The humeral head moves upward towards the coracoacromial arch and inferior surface of the acromion. When the rotator cuff is damaged beyond repair and there is severe degeneration of the humeral head, glenoid or both the use of the Reverse Shoulder Replacement procedure can restore some motion to the shoulder and reduce the pain that the patient has experienced for a long time. The Reverse Shoulder Replacement procedure puts the anatomy of the shoulder in the exact opposite location. The round humeral head is placed where the glenoid fossa was originally, and the glenoid fossa is placed where the humeral head was originally. This placement of the artificial pieces makes movement of the arm possible by using the round ball as a fulcrum to the plastic glenoid fossa. The large deltoid muscle is able to raise the arm to shoulder level or just slightly higher by “pulling” on the humerus and placing the newly placed artificial glenoid fossa up against the round ball and the movement occurs as the glenoid uses the ball as a fulcrum. Pain: The amount of pain felt post-operatively is different for everyone. For the first 24 hours, pain is usually controlled through a long lasting (several hours) numbing agent and possibly a nerve block that the surgeon injects. The day after a surgery, the shoulder is very painful if you move the arm. Pain levels at rest can vary greatly. While the intense pain usually decreases within a few days, you should be prepared to experience varying levels of pain throughout the rehabilitation process. 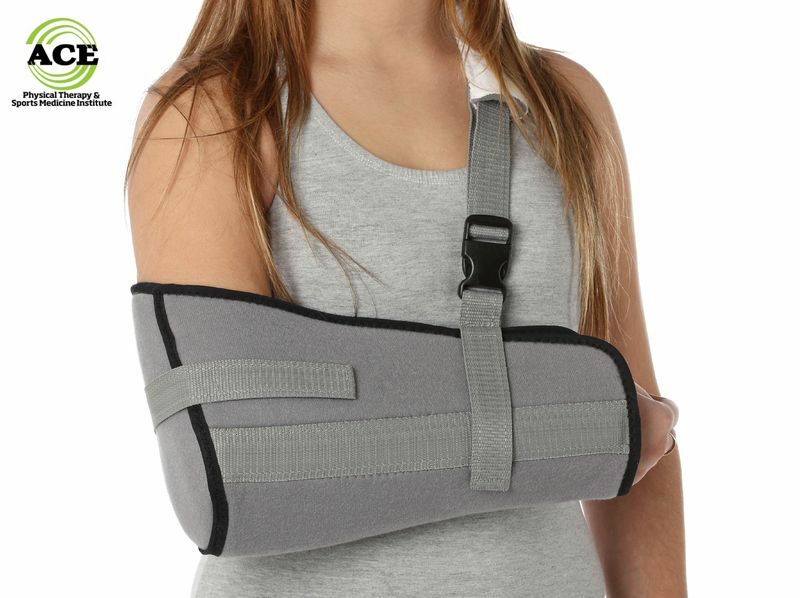 Wearing a sling: For the first couple of weeks, the surgeon will require you to a use a sling that protects the repaired shoulder from quick and sudden motions. This sling should actually help comfort the recovering area while also reducing inflammation. Inflammation causes more pain, less movement and loss of neuromuscular control. Sleeping: Sleeping is difficult and most patients will sleep in an upright position for several days/weeks. Placing a pillow behind the involved shoulder helps to prevent it from “rolling” backwards during sleep. Once you get back into the bed, you may find it more comfortable to wear the sling or prop a pillow under the arm and against the involved shoulder blade. It usually takes several weeks/months to get comfortable enough to lie on the involved side. Driving: Returning to the driver’s seat is determined in part by which shoulder is involved, if the transmission is automatic, and if you have stopped taking narcotics. The doctor ultimately determines when you are ready to drive. If the pain level and movement is adequate, you should be able to resume driving within a few weeks. Return to work: Depending on the type of work, you might return to work within a few days. If your job is physical, you will have to discuss a return date with the doctor. Most people can return to some capacity of work within one week of the surgery date. If your job is physical in nature, it might be several months before you can return and you might not be able to perform full duty capacity. Having fun: You should be able to participate in low level recreational sports, hobbies and leisure activities when the shoulder has healed sufficiently to support the movements and actions associated with that activity. The shoulder will never be able to move above shoulder level with any kind of force therefore this will limit what the patient will be able to do. The human shoulder is the most mobile joint in the body. Unfortunately this excessive motion can lead to damage and breakdown of the articular cartilage. If the damage is severe enough, the patient might be a candidate for a shoulder replacement. The reverse shoulder procedure is used when the rotator cuff muscles are damaged beyond repair. Although this procedure is not capable of restoring full function of the involved shoulder, it is very successful at restoring motion up to and just beyond shoulder level and reducing the pain to a tolerable level.